Maya and Dylan are at an annual mother/daughter tea when Dylan gets some unsettling news. The reason she and her mom never fight is because, according to Maya, Dylan is a mini-me. She looks on in horror at this revelation. JJ's student film, Late August Rain, premieres to tremendous acclaim from the classroom. Until the Q&A takes a personal slant, framing JJ's blossoming feelings for Izzy as a betrayal against Ray's. But luckily the whole thing is a dream, a very weird dream featuring a minotaur and Ray in a grandma outfit for some reason. But when JJ wakes up, having dozed off in film class, he has a chance to chat with Izzy one-on-one about a film sequel. Thinking JJ was merely wing-manning for him, Ray intervenes and he and Izzy go off for coffee together, leaving behind a dejected JJ. Back at home, Dylan has been brooding in the dark pondering this whole "mini-Maya" thing. She asks Ray for his take and he immediately agrees that sums her up which frustrates her even more and now she's going to mess with the dynamic. Which is exactly what Maya would do. But Dylan says no, it's exactly what Dylan would do. Which is also true. Yay, parallels. JJ has a forbidden crush. Who has a forbidden crush? JJ. He makes the mistake of telling Kenneth and within seconds the whole household knows! Ray gives him some advice. He should go Mean Don Juan because all is fair in love and war. Little does he knows, JJ's competition is Ray. Once he finds that out, he's fine with letting JJ have his shot which JJ finds insulting since Ray is clearly only backing down due to JJ being in a wheelchair. Although Ray does make a good argument about the fact he falls in love five times a day. And they're off to the turtle races! Er... maybe not. Kenneth and Jimmy have been trying to make plans for a "guy-hang" but Kenneth keeps getting plans with Melanie. Now Melanie isn't available and they're back on - until they're not. Melanie is available and Kenneth needs Jimmy to distract Joyce so she doesn't show up and ruin the night since she too had plans for this, apparently, hot ticket event. Jimmy pretends to pull a muscle in his back and asks Joyce to help him in order to stall. Also, apparently Joyce thinks Jimmy is a cobbler and honestly, it's not a bad guess. Our mageddon is about to start. Dylan takes a stand against Maya to intentionally start a fight. Maya is against the proposed straw ban since JJ needs straws (and as an aside, this is a great way to introduce the fact people with disabilities are often forgotten about in even the smallest things since we have a real straw ban going on and many people need them to drink). But Dylan says she supports the ban and so naturally, Maya grounds her for one thousand years. In the love triangle, Ray has decided he will compete with JJ and by doing so he'll just be the worst version of himself since, as his own father implies, he rarely meets girls who return his feelings anyways. He does his best to get Izzy to dislike him and it takes a surprisingly long time until she eventually caves and reveals she only gave him a chance because JJ has been talking him up. Things between Maya and Dylan have escalated exponentially. Maya has the door drilled shut but Dylan suspected that and brought a drill - which Maya took the batteries out of. They share a mind! They could be at a stalemate forever. Two other people with a surprising amount in common? Joyce and Jimmy. They're both Kenneth's booty calls since he is the one who is always cancelling plans and leaving them hanging high and dry. Izzy asks JJ if he'll tell her if something is romantic and shows him the Valentine's maze she's set up. Inside, JJ takes the initiative to risk rejection and ask Izzy on a date. In a highly disheartening moment, she says no and uses a lame excuse to do so. The Maya vs. Dylan match may finally be at an end as Dylan shares her grievances with her mother and when Maya refuses to listen, she steals her keys and makes a run for the car before... driving it into the house. Maybe they do share some differences after all since Maya clearly didn't expect that to happen. Being Kenneth's friend might have sounded better on paper than in reality. After Joyce and Kennth say their goodbyes, Kenneth realizes Jimmy actually cares about him and they make a-go of it at the turtle races, drinking beers and being pals. He even cancels on Melanie. But then he starts talking about 9:00 am improve classes and jazz brunches and the panic is visible in Jimmy's eyes. "Do I want to be your friend?" Jimmy questions, "I don't know, I ask a lot." Well at least he's honest! As for Izzy and JJ, it turns out, JJ didn't misread any signals. Izzy does like him, she's just intimidated by his disability and unsure of how it would work with them being in a relationship. JJ is happy to hear this because it means she's being honest and straightforward with him for once and not handling him with kid-gloves. He tells her they can take it one date at a time (plus get a bell for Ray who has been hanging in the door fame the whole time). The Maya and Dylan fiasco has finally fizzled and in fact, something good came out of it. Maya put together a small new alcove for Dylan to have all to herself. Since the insurance people said they would give them a new door but not where, Maya requested they install it in the middle of the kids' shared room. Genius. - Jimmy running into the tea to shout about JJ getting stuck in a hot air balloon sounds just DiMeo enough to be the truth and not just a made-up lie to get them out of there early. - Ray: How long have you been down there? Dylan: To answer the question behind your question, yes I heard you fart let's move past it. - "Ah, it's like we're on The West Wing." - Ray: I just noticed that curvy lamp for the first time. I love her. - I have no idea if this is a popular opinion or not but Joyce is hilarious and I love that she's been around more. - "What does she think a Mageddon is?" - "She's in the walls!" - Ray's binder is a big on the creep-factor to be honest but I had to laugh at: "This girl told me that if she didn't date until she was 30 a witch would give her her parents back. Creative, right?" Also I am totally using that line in real life next chance I get. 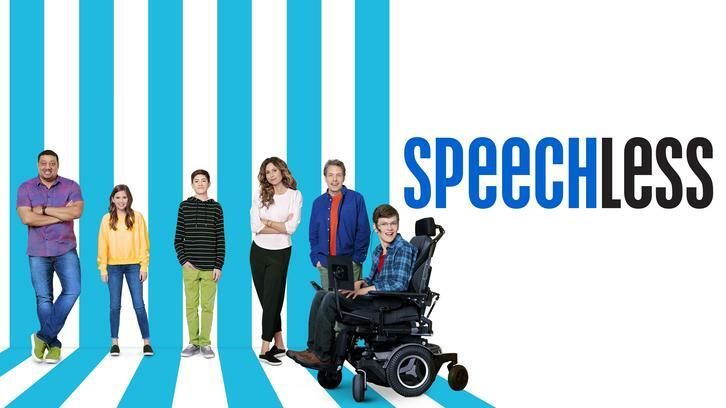 A new episode of Speechless titled "F-A--FASHION 4 A--ALL" airs February 1st on ABC.